Radiation-induced bystander effect (RIBE) refers to radiation responses which occur in non-irradiated cells. It reverses the traditional paradigm that only direct irradiation causes biological effects in living cells. RIBE was observed in patients who underwent radiotherapy 50 years ago, but as it was not fully understood, did not draw much attention. , It was considered as a new phenomenon after Nagasawa and Little reported their observation in 1992. Nagasawa and Little irradiated less than 1% of CHO cells, but sister chromatid exchanges were observed in more than 30% of the cells. Since then, RIBE has been observed in many experiments. The subject has been reviewed in some articles ,,,,, and some authors have described the applications of RIBE in radiotherapy. ,,, RIBE is observed in both tumor and normal cells, as well as for both low- and high-dose radiation. RIBE in radiation therapy resembles a dual-edge sword. It is beneficial as it increases tumor cell killing, while it has adverse effects in normal cells either in near or far distances from the treatment volume. Our knowledge of the RIBE in both tumor and normal cells would help to have a quantitative assessment of the opposing roles of this phenomenon in radiotherapy. If the amount of damages induced by bystander effect (RIBE level) in tumor cells is more than that in normal cells, it may be used to enhance therapeutic ratio. Shao et al. have measured RIBE level for glioma and normal human skin cells. The frequency of micronucleated cells induced by bystander effect was much higher in gliomas relative to normal skin fibroblasts.­  The authors predicted that intrinsic radiosensitivity may be important in defining the bystander response. In this study, we compared the level of micronuclei induced in another couple of tumor and normal cell lines (QU-DB and MRC5) as a result of RIBE to investigate which of them are more susceptible to be affected by RIBE. QU-DB is a continuous human cell line established from a patient with large cell anaplastic lung carcinoma  and MRC5 cell line was derived from normal lung tissue of a 14-week-old male fetus in 1966. MRC5 cells are capable of 42-46 population doublings before the onset of senescence. Cell lines were supplied by the Pasteur Institute in Tehran, Iran. Cells were cultured in RPMI-1640 medium (Biosera, England) supplemented with 10% fetal bovine serum (FBS; Biosera, England), 100 units/ml penicillin, and 100 ΅g/ml streptomycin (Sigma, USA), and maintained at 37ΊC in a humidified atmosphere with 5% CO 2 . Sub-confluent cells were subcultured (5 Χ 10 5 cells) in 25 cm 2 flasks (SPL, South Korea). Flasks containing individuals of each cell line were divided into two groups, target and bystander ones. Exponentially growing QU-DB and MRC5 target cells were irradiated with 0.5, 2, and 4 Gy of gamma rays emitted from a 60 Co teletherapy unit (Theratron, Phoenix model, average dose-rate of 0.764 Gy/min) at room temperature. A group of cells were sham-irradiated and handled in parallel with irradiated cells. To deliver the exact doses, the flasks were placed on a water phantom (30 cm Χ 30 cm Χ 10 cm) which was used for determining the dose-rate, such that the scattering properties of the rays were the same as the conditions of dosimetry set-up. The height of the culture medium in the flasks was 0.5 cm and therefore the cells attached to the flasks were at a depth of 0.5 cm. The filed size was 15 cm Χ 15 cm and source to medium surface distance was 80 cm. 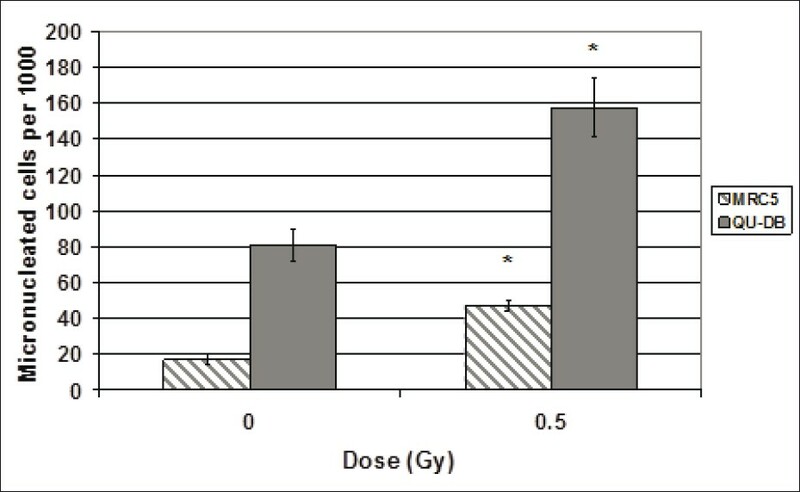 The proper time of irradiation was calculated by dividing the considered dose (0.5, 2, and 4 Gy) by dose-rate at 0.5 cm depth. After irradiation, the flasks were incubated for 24 hours, and then their media were harvested, filtered through 0.22 ΅m acetate cellulose filter (Orange Scientific, Belgium), and transferred to bystander flasks containing the same cell line. As a result, for each cell line, four bystander subgroups were formed (control, 0.5, 2, and 4 Gy bystander subgroups). The first bystander subgroup received medium from sham-irradiated cells and was used as control for the other bystander subgroups. At the same time, as transferring medium, cytochalasin B (Sigma Aldrich, USA) was added to a final concentration of 0.8 and 2 ΅g/ml to QU-DB and MRC5 flasks, respectively. The appropriate concentrations of cytochalasin B were determined before the main experiment. Different amounts of cytochalasin B were added to the flasks. Cells were placed in an incubator for 1.5 doubling time (24 hours for QU-DB and 45 hours for MRC5) and then they were fixed. The least concentration of cytochalasin B which induced more than 50% binucleated cells was determined as the proper concentration for each cell line. The cytokinesis-block micronucleus assay was used to score micronuclei as an end point of RIBE. For this purpose, 24 and 45 hours (1.5 doubling time) following addition of cytochalasin B, QU-DB and MRC5 cells were fixed respectively. QU-DB cells attached to the flasks were washed with phosphate-buffered saline (PBS) and then they were fixed with methanol:acetic acid taken at a ratio of 3:1 (Merck, Germany) for three times. Each time methanol:acetic acid was poured on the cells and they were incubated at 4΀C for 20 min. After the last incubation, walls of the flasks were removed and cells left to dry. MRC5 cells were dried in air and then they were fixed only once with absolute methanol which was poured on the bottom of the flasks and let to dry in air. Fixed cells attached to the bottom of the flasks (as microscopic slides) were stained with 10% Geimsa (Merck, Germany) for 5-6 minutes. In each slide, 1000 binucleated cells were scored. The number of cells containing micronuclei (micronucleated cells) per 1000 binucleated cells (MC) was counted at 400Χ magnification. Micronucleus assay was performed for non-irradiated, 0.5 Gy irradiated, bystander, and control subgroups. The first group is representative of cells with spontaneously induced micronuclei. All the data were distributed normally, therefore parametric tests were used to examine whether the differences between and among the data were statistically significant. One-way analysis of variance (one-way ANOVA) and Tukey's multiple comparison test were performed to compare MC observed in bystander subgroups of individual cell line. Student ' s t-test was applied when only two sets of data were being compared. Direct irradiation induced micronuclei in both cell lines. We also examined the frequency of MC in non-irradiated flasks (spontaneous MC). The average number of spontaneous MC and MC induced by 0.5 Gy irradiation is shown in [Figure 1]. Student's t-test indicated a significant difference between frequencies of MC in 0.5 Gy irradiated cells and spontaneous MC for both cell lines (P < 0.001). There was also significant difference between spontaneous MC of QU-DB and MRC5 cells (P < 0.001) and between MC induced due to irradiation in these two cell types (P < 0.001). The yield of MC induced in bystander subgroups is shown in [Figure 2]a. Medium transfer induced MC in bystander subgroups of both cell lines. Mean of MC induced in QU-DB and MRC5 bystander cells receiving medium from 0.5, 2, and 4 Gy irradiated cells was significantly different from MC values in cells which received medium from sham-irradiated cells (P < 0.005). While the statistical analysis revealed that there was significant difference between 4 and 0.5 Gy and also between 4 and 2 Gy QU-DB bystander subgroups (P < 0.001), there was no significant difference among the MRC5 bystander subgroups (P > 0.05). This observation indicated that RIBE in MRC5 cells was not dose dependent, unlike the QU-DB cells. To compare the RIBE level in the two cell lines, the corresponding subgroups of QU-DB and MRC5 cells were compared by Student's t-test. The results indicated statistically significant differences between all couples (same subgroups of the two cell types) (P < 0.001). Relative MC (RMC) is the ratio of MC induced in bystander subgroups to spontaneous MC of the same cell type. The values of RMC are represented in [Figure 2]b. Data represented in [Figure 2]a indicate that RIBE level in QU-DB cells is dose dependent. Statistical analysis indicated that there was significant difference between 0.5 and 4 Gy and also between 2 and 4 Gy QU-DB bystander subgroups. However, the number of MC induced in MRC5 bystander cells was equal at all doses (P > 0.05), and therefore their response was not dose dependent. The literature indicates that the type of relationship between dose and response to RIBE is dependent on cell type, but no one has evaluated the viewpoint that the association between dose and response to RIBE may be related to the cell being normal or tumoral. If the difference observed between these two cell types is demonstrated in vivo and also in other normal and tumor cell types, it may be related to fractionation regimens used in radiotherapy. It is evident from [Figure 1] that spontaneous MC and MC induced in QU-DB irradiated cells are higher than the corresponding values in MRC5 cells. To our knowledge, there are no published data concerning the radiosensitivity of QU-DB and MRC5 cells, but from this observation it may be interpreted that QU-DB cells are less capable of repairing DNA injuries as spontaneous MC is higher in this cell line, and these cells are more radiosensitive as they are more strongly affected by direct irradiation. [Figure 2]a indicates that MC induced in QU-DB bystander cells is higher than MRC5 cells, similar to the results of direct irradiation. Therefore, it is concluded that QU-DB cells are more vulnerable than MRC5 cells to be affected by RIBE. It can also be concluded that there is a positive correlation between RIBE level and damages induced in QU-DB and MRC5 cells spontaneously or by direct irradiation. However, in view of radiation protection and radiation therapy which may be affected by RIBE, the above argument (the quantity of signaling or the kinetics of RIBE) is not as important as DNA damages fixed in bystander cells; and our results indicated that the level of fixed damages (micronuclei) induced by bystander effect was more pronounced in QU-DB cells which are more affected by direct irradiation. Intention of some investigations to find out whether there is a similar correlation between damages induced by bystander effects and direct irradiation in other tumor and normal cells is valuable as radiotherapy is still based on difference in radiation sensitivity of normal and tumor cells. Besides the visible characteristic of RIBE remarked by the level of damages induced in DNA, the mechanism of induction of bystander effect in tumor and normal cells is also important as it may be different in tumor and normal cells. If this is true, it may be used to enhance therapeutic ratio. To achieve this goal, the different likely mechanisms of RIBE in tumor and normal cells will be applied to enhance RIBE in tumors and decrease it in normal tissues. Some differences have been observed in the factors responsible to transfer bystander signals in tumors versus normal cells. Burdak-Rothkamm et al. observed that 90 minutes after irradiation, both reactive oxygen spices (ROS) and cell membrane were still active in glioma cells to transfer bystander signals, whereas in normal human astrocytes only the cell membrane was active. In addition, differences have been noticed in the molecules responsible to transfer bystander signals in P53-mutated and wild-type cells. Nitric oxide (NO) production is downregulated (inhibited) by P53 proteins, thus it is abundant in P53-mutant or -deficient cells and acts as an RIBE signaling factor;  however, some researchers have reported that in wild-type P53 cells, ROS substitutes the NO. , It may be predicted that by scavenging ROS, it is possible to decrease or inhibit RIBE in normal (wild-type P53) cells while it may remain constant in P53-mutant tumor cells. Despite this conclusion, Harada et al. have reported that NO contributes to bystander signal formation in normal human fibroblasts. Konopacka and Rezszowska-Wolny observed that vitamins C and E do not protect human leukemia cells against death induced by direct X-irradiation or RIBE, whereas in other studies the protective effect of vitamins C and E against chromosomal damage, as well as induction of resistance to different death stimuli in normal cells, has been reported. Burdak-Rothkamm et al. detected gamaH2AX only in S phase bystander cells, and not in G1 or G2 phases of cell cycle.­  Therefore, it is reasonable to conclude that tumor cells, irrespective of their repair ability, are more vulnerable to bystander DSB because relatively larger fractions of these cells are in S phase. These facts illustrate that broadening of our knowledge in phenomenology and mechanistic differences of RIBE in tumor and normal cells is an important task and may be exploited in future radiotherapy. The authors thank the office of Vice-President for Research of Mashhad University of Medical Sciences for funding this work. The authors are also grateful to Omid hospital for making use of Co-60 teletherapy unit possible. 1. Mothersill C, Seymour C. Radiation-induced bystander effects: Past history and future directions. Radiat Res 2001;155:759-67. 2. Mothersill C, Moriarty MJ, Seymour CB. Bystander and other delayed effects and multi-organ involvement and failure following high dose exposure to ionizing radiation. Br J Radiol Suppl 2005;27:128-31. 3. Mothersill C, Seymour C. Radiation-induced bystander effects: Are they good or bad or both. Med Confl Surviv 2005;21:101-10. 4. Azzam EI, Little JB. The radiation-induced bystander effect: Evidence and significance. Hum Exp Toxicol 2004;23:61-5. 5. Hamada N, Matsumoto H, Hara T, Kobayashi Y. Intercellular and intracellular signaling pathways mediating ionizing radiation-induced bystander effects. J Radiat Res 2007;48:87-95. 6. Prise KM, O'Sullivan JM. Radiation-induced bystander signaling in cancer therapy. Nat Rev Cancer 2009;9:351-60. 7. Trott KR. Non-targeted radiation effects in radiotherapy. ActaOncol2001;40:976-80. 8. Mothersill CE, Moriarty MJ, Seymour CB. Radiotherapy and the potential exploitation of bystander effects. Int J Radiat Oncol Biol Phys 2004;58:575-9. 9. Mothersill C, Seymour C. Radiation-induced bystander and other non-targeted effects: Novel intervention points in cancer therapy? Curr Cancer Drug Targets 2006;6:447-54. 10. Shao C, Folkard M, Michael BD, Prise KM. Bystander signaling between glioma cells and fibroblasts targeted with counted particles. Int J Cancer 2005;116:45-51. 11. Cole SP, Campling BG, Dexter DF, Holden JJ, Roder JC. Establishment of a human large cell lung tumor line (QU-DB) with metastatic properties in athymic mice. Cancer 1986;58:917-23. 12. Jacobs JP, Jones CM, Baille JP. Characteristics of a Human Diploid Cell Designated MRC-5. Nature 1970;227:168-70. 13. Sokolov MV, Smilenov LB, Hall EJ, Panyutin IG, Bonner WM,Sedelnikova OA. Ionizing radiation induces DNA double-strand breaks in bystander primary human fibroblasts. Oncogene 2005;24:7257-65. 14. Hu B, WU L, Han W, Zhang L, Chen S, Xu A, et al. The time and spatial effects of bystander response in mammalian cells induced by low dose radiation. Carcinogenesis 2006;27:245-51. 15. Sedelnikova OA, Nakamura A, Kovalchuk O, Koturbash I, Mitchell SA, Marino SA, et al. DNA double-strand breaks form in bystander cells after microbeam irradiation of three-dimensional human tissue models. Cancer Res 2007;67:4295-302. 16. Burdak-Rothkamm S, Short SC, Folkard M, Rothkamm K, Prise KM. ATR-dependent radiation-induced γH2AX foci in bystander primary human astrocytes and glioma cells. Oncogene 2007;26:993-1002. 17. Matsumoto H, Takahashi A, Ohnishi T. Radiation-induced adaptive responses and bystander effects. Biol Sci Space 2004;18:247-54. 18. WangR,Coderre JA. A bystander effect in alpha-particle irradiations of human prostate tumor cells. Radiat Res 2005;164:711-22. 19. Harada T, Kashino G, Suzuki K, Matsuda N, Kodama S, Watanabe M. Different involvement of radical species in irradiated and bystander cells. Int J Radiat Biol 2008;84:809-14. 20. Konopacka M, Rzeszowska-Wolny J. The bystander effect-induced formation of micronucleated cells is inhibited by antioxidants, but parallel induction of apoptosis and loss of viability are not affected. Mutat Res 2006;93:32-8. 21. Burdak-Rothkamm S, Prise KM. New molecular targets in radiotherapy: DNA damage signaling and repair in targeted and non-targeted cells. Eur J Pharmacol2009;625:151-5. Soleymanifard, S., Toossi, M.T.B., Sazgarnia, A., Mohebbi, S.